Respondents might find the entire question bizarre, as requiring a private company to damage its product for information on a crime the FBI had already solved would be a tremendous waste. 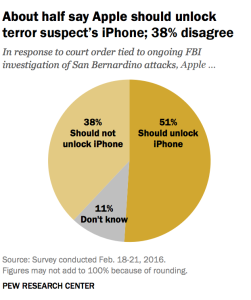 Based on the argument I laid out here — that the information the FBI might get from Syed Rezwan Farook’s work phone wouldn’t add all that much to what they presumably already got off two phones he tried unsuccessfully to destroy, as well as the phones or iCloud accounts of his colleagues — that’s the question I think Pew should have asked in its poll. 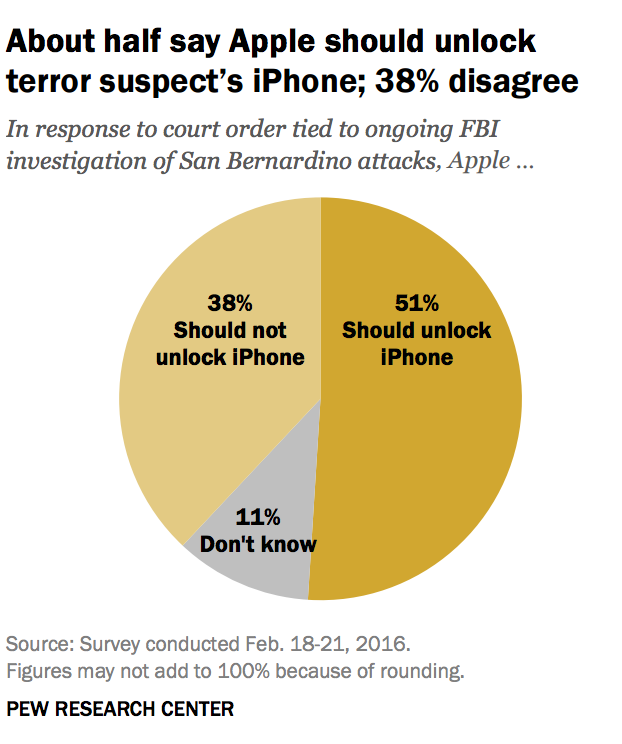 As you may know, RANDOMIZE: [the FBI has said that accessing the iPhone is an important part of their ongoing investigation into the San Bernardino attacks] while [Apple has said that unlocking the iPhone could compromise the security of other users’ information] do you think Apple [READ; RANDOMIZE]? To be fair to Pew, FBI has said this phone will be “important,” and to Pew’s great credit, they described Apple’s stance to be about security, not privacy. But the fact of the matter is FBI is demanding access to this phone knowing full well who the perpetrators are — Farook and his wife — and knowing (per Admiral Mike Rogers and a slew of FBI statements before his) that the couple didn’t have overseas help. San Bernardino was, the FBI has known for months, a particularly brutal workplace killing inspired by radical Islam. I sort of suspect Americans might think differently about this particular back door request (though maybe not another case where the phone really would be central to solving the case) if it were explained in those terms.